Home » Cactuses or Cacti – Which is Correct? If you go on a road trip to the southwestern United States, you will see many strange plants. Some of them have thick, fleshy stems with thin, sharp spines. This plant is called a cactus, and it is common in many parts of America, including Mexico, Canada, and as far down as Argentina. If you speak with enough people on your tour, you will likely hear the plant’s name pluralized as both cactuses and cacti by English speakers. Continue reading if you aren’t sure which version you should use. What is the Difference Between Cactuses and Cacti? In this post, I will compare cacti vs cactuses. I will use each of these words in at least one example sentence, so you can see them in context. Plus, I will show you a helpful memory tool that will make choosing cacti or cactuses a bit easier. Cactus plural: Cacti is a noun. It is the plural form of cactus, which refers to members of a family of spiny plants. Cacti are famous for having sharp spines. They can survive extreme conditions by storing water in their stems for extended periods of time. Cacti are native to the Americas. They grow wild in the deserts of the western United States and are cultivated as decorative indoor and outdoor plants in many areas. Saguaro cacti are familiar imagery in the Western film genre, where they are instantly recognizable by their stark silhouettes and sharp spines. Here are some examples of cacti in a sentence. Botanists have discovered over 1750 distinct species of cacti, which range from one centimeter to nearly 20 meters tall. Remi decorated her apartment with tiny cacti, which gave the home a southwestern aesthetic. Cactus plural: Cactuses is an alternative spelling of the same plural noun. According to Bryan Garner (2016), both are accepted variants. Cactuses is more common in speech and ordinary usage, while cacti is favored in print sources and scientific uses. The chart below, which graphs cactuses vs. cacti in English books since 1800, verifies the preference for cacti in print. In the sentences above, cactuses can be substituted for cacti without changing the meaning. The singular cactus can itself be used as a plural noun, though it is still not as common as cacti. Cactus is originally a Greek word, and it came to English through Latin. The -i for -us plural is common in Latin, and since the scientific names of plants are usually related to Latin, it’s not surprising that cacti became widespread in English. You could use either cacti or cactuses and still be correct. In formal (especially scientific) writing, cacti might be a better choice, since that form is more common in written English. In most informal writing, you could rely on your best judgment and use whichever version seems more natural. Since cacti and writing each contain the letter I, you can use this shared letter as a reminder to stick with cacti in formal writing. Is it cactuses or cacti? Cacti and cactuses are alternative forms of a plural noun that means more than one member of a family of spiny plants. 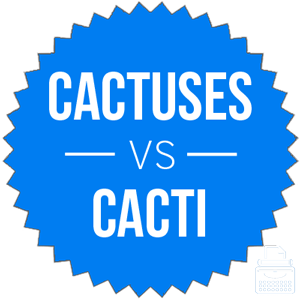 Both forms are correct, but cacti is more common in published writing. 1 What is the Difference Between Cactuses and Cacti?